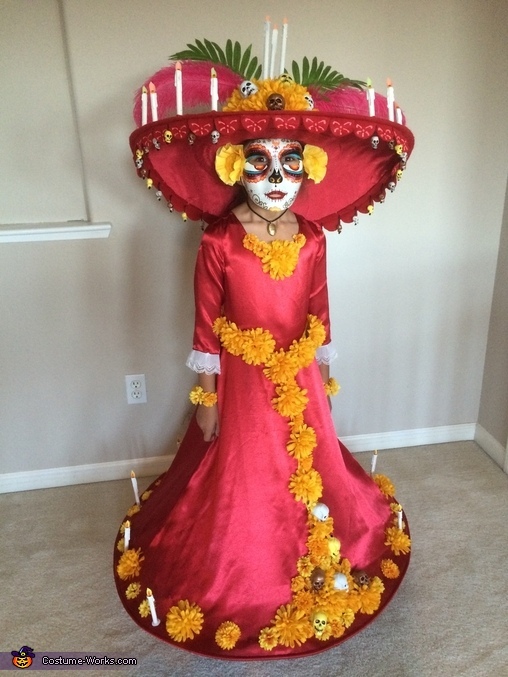 This is my daughters Halloween costume of La Muerte from the children's animated movie "the book of life" . The moment she saw this movie it was her favorite she wanted to be la muerte for Halloween because she thought she was so beautiful. Of course there's no premade costumes for this character like there are for every other children's movie..so here we are! -The dress is made from sheets bought at a local thifrt store for $3. Some of the fabric was also used on the hat. All of the flowers and candles are sewn on. The the bottom of the dress has a plastic tubing like the ones used on the back of refrigerators with wire run though it to hold the shape and hangs a couple inches off the floor to create the look like she's floating like the character in the movie. -the hat is made from many different materials. Started with a small child's Easter sun hat with a 3" brim found at a dollar store ($1) then built up the brims size by adding a thin light pvc panel used as a display poster at Home Depot (free!) covered the brim in the fabric used on the dress. The candles on the hat are made from slurpee straws with the spoon end cut to the shape of flames. The candle sticks are made from milkshake straws with hot glue dripped down the tops then painted to look like melting candels. The candels on the hat have a strand of led lights ($4) on a battery pack to light up to create the look of burning candles. The trim on the brim is felt hand cut and panted. All of the skulls ($4) are also all hand painted. -the mask is an adult plain white mask ($1) cut down to fit my kiddos little face. It it all hand painted the base white is done with a hammered texture paint to give it that pitted vintage look and the rest is painted with hobby paint, paint markers, and nail polish. Painting a mask was a last minute decision to save from doing hours of make up that can easily get messed up..and it also lest her be able to keep it for dress up! I am trying to build this costume my self but can't seem to fin the right skulls. where did you get them from ? Hi I love this costume can you pls let me know how to make the dress,I want to make for my granddaughter for Hallowwen is her dream thank!!!! Hi, If you still have the costume I would like to buy it for my daughter.